Being a blogger, blessed with blogger friends, Swissvita has been spreading around my social media, and I decided to test the product myself. So here I am, writing a review on it to see how well it works. Let me tell you a story about my first expression with Swissvita, due to hormones (Y'all know what im talking about), I had pimples popping like popcorn and after 2 days of using the Swissvita Acne Solution Soothing Cleanser Cream, my pimple vanished! Being 'wow'ed' throughout the whole experience, I just had to share it out with you! The other product would be the Swissvita 3D Micrite All use Eye Cream which also was a big help to reduce my eye puffiness problems. So, let's get into details with the review. Scroll away! The Swissvita Acne Solution Soothing Cleanser Cream has been dubbed as the best acne face wash by dermatologists and I can't believe I have one to try out for myself. Im thankful that my puberty teenage acne is over, but due to all the stress in our daily lives, it can get rather challenging to prevent acne. So what better way to prevent acne than to get yourself an acne face wash by Swissvita. Other than acne spot treatments, creams, and serum, I believe that using the right face wash plays an important role too! The Swissvita Acne Solution Soothing Cleanser Cream comes in a 100g tube, has a 6-month life once it's opened and is suitable for oily combination skin. This cleansing cream contains citric acid, which is ideal to keep your pores clean and it also targets stubborn acne that causes breakouts. Let me emphasize to you that this is not an everyday cleanser, but its to be used according to your needs as acne cleansers are usually slightly drying in the long run. So don't throw away your current facial cleanser as you can plan your week on using this on alternate days. Which also means that this would be good enough to possibly last you about 6 months depending on how often your acne problem attacks. The next featured item in this post would be the Swissvita 3D Micrite All use Eye Cream. Being in my mid-twenties, I would advise you to get an eye cream stat to prevent unwanted eye wrinkles, puffy eyes, and dark circles. Due to work, stress and your lifestyle, your eyes can really show how you live your life as the skin around the eyes is more fragile, prone to dryness and quicker to show age and fatigue without proper treatment. Yikes! Did you know squinting and constant movement of the eys can also hasten the appearance of lines and wrinkles too? Lucky enough, with the right eye cream, they can address some of these issues. The Swissvita 3D Micrite All Use Eye Cream comes in a 15g aluminum tube and has a 6-month life once it's opened. From a first glance at the packaging, I'd like to give credit to the aluminum sealed package giving it a very fancy feel to it. Like most medical creams, they use aluminum sealed packaging to prevent the risk of contamination by external air pressure. Bonus points to Swissvita! Since its new, I noticed that the packaging has a special way to open it. 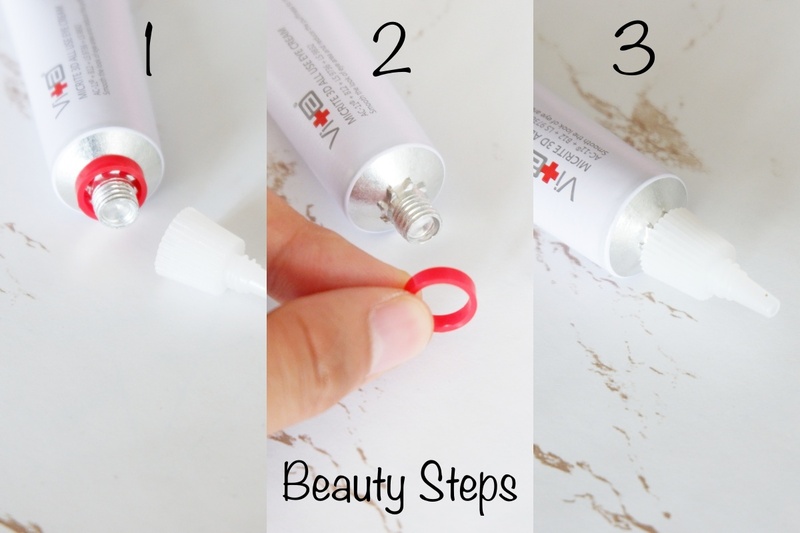 To start using this, you'd need to remove the red colored bottle cap and tighten the cap to poke open into the foil. Hygiene proved right there guys. I personally like to use this as my daily skincare routine and im loving the end results each time I use it! With this eye cream, it can prevent your eye area from aging, wrinkles, dark circles and puffiness. Its suitable for any skin type and super easy to apply. To apply, gently squeeze out a small dot of the cream around the cleansed eye area and pat your eye area lightly until cream is fully absorbed. A few things that I would like to emphasize would be that it feels very natural on the skin and it has a water-based texture. Its also paraben free, fragrance-free and alcohol-free, thus you won't have to worry about unwanted chemicals around your eye area. A personal highlight I noticed would be that it instantly lifts in just 7 seconds from the application! With that as a statement of its own, this is the ultimate eye cream with instant results. What are my thoughts on the Swissvita skincare products? As a verdict, I would have to say that both these products are very much reliable (tested) and I personally would recommend this to those who are having problems or would like to prevent acne and eye aging problems. Price range would be fair to me knowing that the products would last more than 2 months, and in terms of the quality of the product, it has been very well thought of to fight specific problems. I can be a little skeptical of mixing different brands in my skincare routine, but trust me, if the products are well designed, it should be compatible with your skincare without causing any breakouts and irritation. I have 5 different brands in my skin regime, and my skin is absolutely fine despite adding Swissvita in as well.